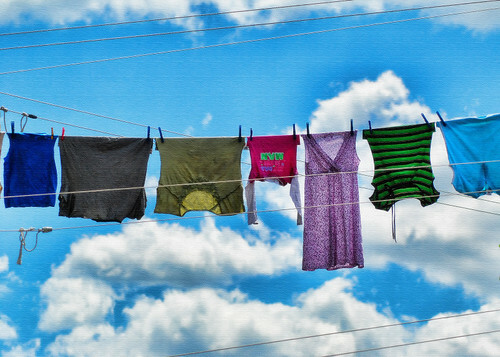 Hanging laundry on a clothesline is a great way to save energy while cleaning. (cc image courtesy of mysza831 via Flickr). People of faith who care about God’s creation face another confounding factor: How we do we tend our homes without hurting the planet, and our families, with the non-biodegradable, toxic substances found in so many cleaning products? Fortunately, it is getting easier than ever to care for our homes with cleaning solutions that aren’t hard on human health or the environment. The added bonus of homemade and “green” cleaning products? You’ll save money while exposing your family to fewer harmful chemicals. Sleeth hits on the question many of us have when it comes to green cleaning: How do I do it? We’ve prepared this guide to help answer that question. Below you’ll find tips, how-to’s, and ideas to answer many of your questions. If you think of one we haven’t covered, leave us a comment about it on our Facebook page and we’ll try to find you the answer. Clean the house as a family every Saturday in preparation for the Sabbath. The anticipation will make this day of God-ordained rest all the more precious. (View the rest of Nancy Sleeth’s top 10 tips). Baking soda is a great all-purpose cleaner. Use it to clean carpets; deodorize your refrigerator; scour toilets, pots, pans, and even the kitchen sink! Vinegar is another great everyday cleaning product. It works well for shining chrome, cleaning surfaces, getting rid of lime deposits in tea kettles, removing animals stains, and many other uses. Two parts olive oil mixed with one part lemon juice makes a quick furniture polish that leaves wood shining and smelling fresh. Boil cinnamon, mint, or other herbs to keep the air in your house smelling good without store-bought air fresheners, which often contain toxic chemicals. Use old clothing as rags for scrubbing. Use Borax instead of powder bleach, especially for cleaning showers. It also works well as a “laundry booster” to go in with the wash.
Make a rule to always take your shoes off at the door. Mix four tablespoons of lemon juice with half of a gallon of water to make a chemical-free glass cleaner for windows and mirrors. Liquid castile soap (such as Dr. Bronner’s brand, available in most health food stores) works well for anything you would use a liquid soap for, such as laundry or shampoo and contains only natural ingredients. If you use a dishwasher to clean your dishes, pre-scrape plates and bowls before loading them and do not run a load until the machine is full. If you are cleaning dishes by hand, submerge dishes in hot, soapy water then wash the suds off in a tub of water mixed with a dash of vinegar. Avoid constantly running the water as you wash.
Start a compost bin for food scraps. If you’re not sure how to get started, read our guide to composting for some pointers. The fewer things you have, the less there is to clean. Hold a garage sale, sell your things online, donate to charity, or freecycle unneeded items to reduce your clutter. Use a drying rack or clothesline to dry your laundry instead of machine-drying it. Household plants act as living air filters; planting a few can freshen the air in your house. Mix one cup of vinegar with a gallon of water to create a floor-cleaning solution that you don’t have to rinse afterward, saving time and water. Try to clean without producing waste. Trade paper towels for rags and sponges for Swiffers. Look at what is in the trash after you clean and brainstorm ways to substitute it for something reusable. If you have a clogged drain don’t use toxic chemical drain cleaners. Try a mixture of baking soda and vinegar first. If you have a carpet spill, pour club soda on the area as soon as possible. The carbonation brings the spill to the surface and the salts prevent staining. Mix tea tree oil with water and put it into a spray bottle. Prevent mold by spraying this solution on the shower curtain and other surfaces. This is a really nice list I would like to also recommend that when we go to buy a laundry drying rack or clothesline that we buy as local as we can. Made in America products do not have to travel near the distance saving many resources.